With fight week underway in Las Vegas, former four-division world champion Adrien “The Problem” Broner hosted a media workout Monday before he battles Manny Pacquiao for the World Boxing Association Welterweight World Title Saturday, January 19 in the main event of a SHOWTIME PPV® event from the MGM Grand Garden Arena in Las Vegas. “Every fighter is different, but I know if I touch him flush, I’ll put him out. It’s no secret, he’s been to sleep before. “I’m in shape and ready to go. We had a tremendous training camp. I could have made weight weeks ago. We’re prepared to go out and execute. “I’ve been here before, and even though I haven’t been in a fight of exactly this magnitude, I’m just treating it like any other fight. He’s another opponent. “A lot of people are saying that Pacquiao’s age will be a factor, but I’m not looking at it like that. You see guys like Floyd Mayweather who stay undefeated at an older age. I’m just focused on being me. As long as I do what I have to do, I will be victorious. “We’re ready for whatever this fight is going to end up being. It could definitely be a war. I’ve always been an underdog. I came from the trenches and I’m bringing that mentality into the ring. “I can take over boxing with a win over Pacquiao. There are a lot of great fighters in this sport, but they just don’t bring what I bring to the table. With a win like this, it would put me right where I was always meant to be. “I’ve always wanted to fight the big names like this and I knew that I just had to keep working hard and the time would come. “Preparation has been great. Camp has been tremendous. Adrien is ready to go and extremely focused for this fight. He came into camp that way and it’s stayed that way. “We added some things this training camp, because we know he’s fighting a legendary fighter. This is one that he has to have and he realizes it. I expect a spectacular performance. “I think on Saturday night that Adrien is going to be that guy that everyone expected him to be from day one. It will open a lot of eyes. I believe that we put the work in. I can’t see Adrien coming out of there without a victory. “The key to victory is for Adrien to just be himself. He has to do what he does best with no hesitation. He’s going to throw the right punches at the right time. “Pacquiao still throws combinations but they don’t come in as fast or as sharp as they used to. He can throw as many punches as he wants to throw, but if they’re not landing, it doesn’t mean anything. 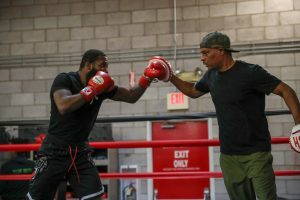 The post Adrien Broner Las Vegas Open Work Out Quotes appeared first on BoxingInsider.com. Skillshot announces Paladins Premier League and SMITE Pro League organisations for 2019.